Disclosure: Some of the products featured in this post were provided for free. I am currently on my first vacation in two years! And it is a vacation to the number one destination I’ve always wanted to go to: Paris, France! Since I am going to be doing a lot of travel on foot and public transportation, I didn’t want a lot of luggage to drag around with me. So, I brought just an under-the-seat carry-on and my camera bag for my 10-day trip to Paris in winter. 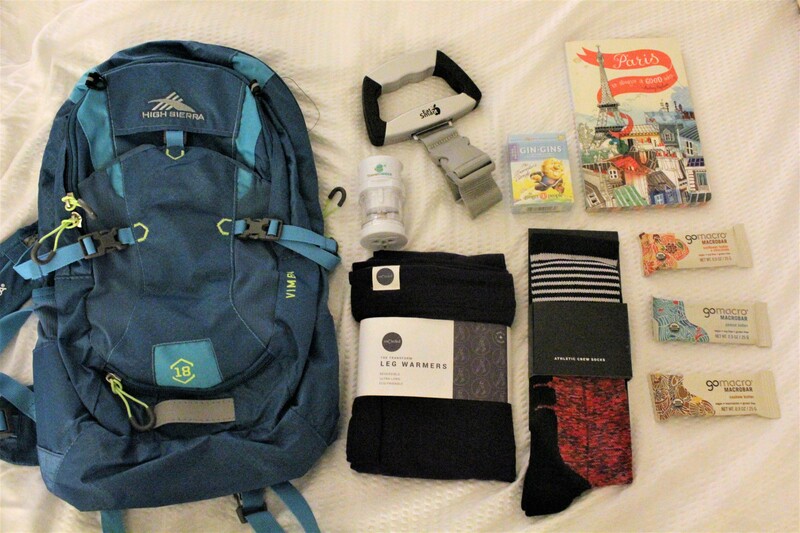 Now I’m here to share with you what my winter time carry-on essentials are. Travelling overseas is definitely doable, even in a small bag! For my carry-on itself, I am using a High Sierra backpack. It will be easy to carry throughout the airports and metro, and is compact enough to fit under the seat on the plane. Since the airline I’m taking weighs carry-ons, the High Sierra backpack was perfect for me to use, since the fabric is very breathable and light. It also has some slight stretch to it, so it is great at fitting all of my winter items! Since I like to fly at a low cost, to keep my budget open for other fun adventures, I like flying WOW Airlines. They make international travel quite affordable! However, the carry on that’s included in your ticket price does have a weight limit. So I am bringing along with me the EatSmart digital luggage scale. This way, I can make sure my carry-on is the correct weight limit before my trip, and when coming back. I use EatSmart’s digital kitchen scale, and love it! Their digital luggage scale is just as precise. You can find it here. But since I do get very cold, I brought a couple more important items. I brought along 3 pairs of Vybe socks. I love that Vybe’s athletic socks are very warm, yet stylish! So often athletic socks are a sold color, but Vybe’s socks come in stylish colors, without sacrificing practicality. Vybe socks are sold on Amazon, and you can find them here. I also packed Encircled leggings. These are leggings that reach mid-thigh, and have so many ways to keep you warm! I wear them under my pajama pants at night for extra warmth, or over my tights when I’m wearing skirts in the snowy weather. I also love just wearing them in boots, so that when I walk long distances I have extra cushion are my foot. They are super soft, and comfortable to sleep in, even, and I love that they don’t feel bulky! You can find Encircled leggings here. Toiletries (deoderant, toothbrush, toothpaste, shampoo, conditioner, lotion (for the cold weather), hairbrush, and razor. One of the most essential items of course, is an outlet converter. I personally love the universal outlet converter from TravelGenixx. It’s super affordable ($11.97), and is compact, and very easy to use! You can find the TravelGenixx universal outlet converter, and other handy travel items from them here. I also brought a travel sized box of Gin-Gins ginger candy. These candies are a homeopathic way to ease stomach upset. When travelling overseas and eating unfamiliar foods, I think it’s nice to be prepared and have a nausea solution, in case you need it! I also wanted healthy snacks to be able to have throughout the day during my travels, and for the plane and airport layovers. I rather save my money for fun adventures in Paris, rather than expensive airport food! I also like to keep my clean eating habits while on vacation, so I brought a bunch of mini GoMacro bars with me in my carry-on. These bars are gluten-free, and all-natural, and oh so delicious! You can learn more here. And last but not least, a journal! To be honest, I haven’t written in a journal for quite some time. With my blogging job, I am on social media quite often, which has wedged out journalling. However, since I want my vacation to be pretty tech-free, I wanted a journal to be able to write letters to my daughter (to give her when she’s older), and any other thoughts and dreams I may have while travelling! Not to mention, it will give me something fun to do while on my flight. I hope this post helps you travel light while on your own adventures. Travel safely, and Bon voyage!